Do You Believe in Miracles is a charity single, released by RCA on 22 November 1985. Included on the band's 1985 studio/compilation album Crackers: The Christmas Party Album, the song reached No. 54 in the UK and remained in the charts for six weeks. It was written by Noddy Holder and Jim Lea, and produced by John Punter. Following the release of the band's 1985 studio album Rogues Gallery, the band were approached by Telstar to create a Christmas-related party album. 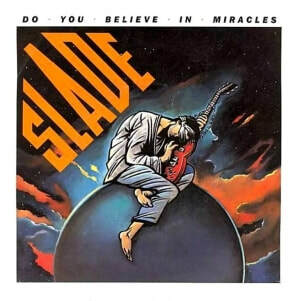 At the same time, the band decided to record a charity single, "Do You Believe in Miracles", for the Christmas period, which was recorded at Portland Studios in London and released in November 1985. Despite receiving regular airplay on radio, the song peaked at No. 54 in the UK. Although it was not released in Europe, the song received airplay across the continent and was listed on EMR's Eurotipsheet as a "sure hit" in November 1985. It also reached No. 48 on the European Airplay Top 50. In a 1999 interview, Lea recalled how a man had confronted Lea when the band were performing the song on UK TV. The man had said "That's a great song, but it won't be a hit". When Lea asked why, the man replied "It's too good". Regardless, the single did raise funds for charity, with all publishing royalties being donated equally to the Band Aid Trust and British Children in Need (N.S.P.C.C.). In a 1988 fan club interview, Lea revealed: "Certainly a few thousand pounds have been paid over and I keep getting these very nice letters all the time saying "Thank you very much, Mr Lea"." "Do You Believe in Miracles" was inspired by Bob Geldof and the benefit concert Live Aid. Holder's lyrics reflected his thoughts on Geldof's achievement with Live Aid, while also referencing Slade's past encounter with him in the late 1970s, at a time when the band's popularity was low. Appearing on the TV show Juice in 1985, Lea spoke of the song: "It's about Bob Geldof actually and when the group was down the nick he came to see us, and he said "How can a group that's so big be playing a little club like you're playing now". And we said "Well, we just decided to carry on, we didn't want to pack up." And he said "Oh, I couldn't do that" but he did, and then he did the Live Aid thing, and I thought it was worth writing a song about." Later in 1986, Lea recalled of the song's airplay: ""Do You Believe in Miracles" was played to death on the beeb. I really believed in that record. I didn't like the sound of it on the radio though. I tried to combat that in my own way, but we'd reached the fourth mix of that single and by then I think everybody was past doing another mix. I was happy with the first mix because I knew it would have sounded good on the radio." Don Powell said: "It didn't do too well chartwise, but it had every radio play in the book really. I could never turn the radio on without hearing it played. We did quite a few T.V. shows to promote it - but when we recorded them, when the record first came out - all the T.V. shows centred around Christmas, so we missed out on the initial thing. If we'd have had those T.V. 's when the record was actually released, that would have helped a lot more. The radio play was incredible though, even Alan James, our plugger couldn't understand it." "Do You Believe in Miracles" was released on 7" and 12" vinyl by RCA Records in the UK, Australia, Ecuador and across Europe, including Germany and the Netherlands. The B-side, "My Oh My (Swing Version)", was exclusive to the single and would later appear on the band's 2007 compilation B-Sides. On the 12" single, an extended version of "Do You Believe in Miracles" was featured as the A-side, and a second B-side, "Time to Rock", was taken from the Rogues Gallery album. In the UK, a limited double-pack Christmas edition of the single was also released on 7" and 12" vinyl. Dubbed "The Slade Christmas Pack", the 7" version included the standard 7" single along with a second 7" vinyl featuring "Santa Claus Is Coming to Town" as the A-side and "Auld Lang Syne/You'll Never Walk Alone" as the B-side. Both tracks were from the Crackers album. The 12" version featured the same three tracks as on the standard 12" version, with the two Crackers tracks added. The band had not intended for "Do You Believe in Miracles" to be included on the Crackers album, however Telstar insisted that it was included on there. In a 1986 interview, Powell responded to the theory that the single failed to chart higher due to its inclusion on the album: "That could be a reason. Funnily enough, that was one of the bones of contention - Telstar said that they wanted it on the album, whereas we didn't because that would mean that it would split the sales between the single and the album. I know that if I personally like someone's single, and it's going to be on their latest album, then I'll wait and buy the album." In the UK, the band performed the song on the TV shows Krankies, Razzmatazz and Saturday Superstore. A music video was filmed to promote the single, which was directed by Phillip Davey. The video featured three sequences. One was filmed in an attic with Holder dressed in a jacket, peering through a telescope, plotting the course of Halley's Comet. The second featured the band performing the song in front of a white curtain backdrop which was blown to create a wind-tunnel effect. The third sequence had the band performing the song in front of a live audience, with the band sitting on stage, surrounded by a mass of candles, all with acoustic guitars except Powell. The final shot showed the band all together in the attic; Hill with the black cat on his shoulder, seeing Halley's Comet through the telescope. RTL 208 (Radio Luxembourg, London) picked the song as one of their "Records of the Week" during December 1985. In November 1985, Eurotipsheet, a publication on European radio programming, listed the song as a "sure hit". Australian newspaper The Age (published in Melbourne) commented: "Even if Bob Geldof misses out on this year's Nobel Peace Prize for his Live Aid triumph, at least he would have been immortalised in song by Slade. This ditty is a tribute to Geldof's efforts and celebrates how rock 'n' roll can give the world a little hope. "Time to Rock" is a gutsy, infectious, foot-stomping, caveman anthem designed, one imagines, to be chanted (and whistled) in pubs by Slade fans after concerts and before soccer matches." John Punter - producer of "Do You Believe in Miracles"
Monty Babson - producer of "My Oh My (Swing Version)"
Stan Butcher - arranger on "My Oh My (Swing Version)"